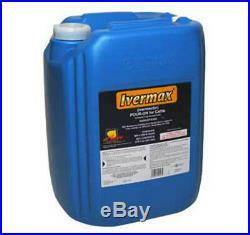 IVERMECTIN Pour On Cattle Wormer 20 Liter Internal External Parasite Control. 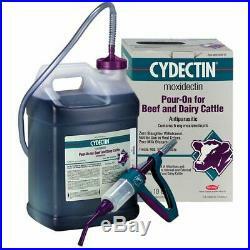 Ivermectin Pour On for Cattle contains 5 mg ivermectin/ml. 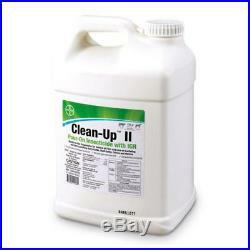 It delivers internal and external parasite control in one convenient low-volume application. For the treatment and control of gastrointestinal roundworms (including inhibited Ostertagia ostertagi) lungworms, grubs, horn flies, sucking and biting lice, and sarcoptic mange mites in cattle. The dose is 1 ml for each 22 lb of body weight. Do not use in female dairy cattle of breeding age. Cattle must not be treated within 48 days of slaughter for human consumption. DIRECTIONS: The dose rate is 1 ml for each 22 lb of body weight. The formulation should be applied along the topline in a narrow strip extending from the withers to the tail. Administration- Squeeze-measure pour system (250ml or 1 liter bottle with 25 ml measuring Cap) Attach metering cap to bottle. Select the correct dose rate by rotating the adjuster cap in either direction to position the dose indicator to the appropriate dose. Gently squeeze the bottle to fill to level (any excess will return to bottle) and then tip and apply to animal along topline. Backpack 84.5 fl oz/2.5L pack and 169 fl. Connect the applicator gun to the backpack as follows: Attach the open end of the draw-off tubing to the DOSING EQUIPMENT. Because of the solvents used in the formulation, only the Protector Drench Gun from instrument Supplies Limited, or equivalent, is recommended. Gently prime the applicator gun, checking for leaks. S directions for adjusting the dose. When the interval between uses of the applicator gun is expected to exceed 12 hours, disconnect the gun and draw-off tubing from the product container and empty the product from the gun and tubing back into the product container. To prevent removal of special lubricants from the Protector Drench Gun, the tubing must not be washed. WHEN TO TREAT CATTLE FOR GRUBS: IVERMECTIN Pour-On effectively controls all stages of cattle grubs. However, proper timing of treatment is important. For the most effective results cattle should be treated as soon as possible after the end of the heel fly (warble fly) season. While this is not peculiar to ivermectin, destruction OF Hypoderma larvae (cattle grubs) at the period when these grubs are in vital areas may cause undesirable host-parasite reactions. Killing Hypoderma lineatum when it is in the esophageal tissues may cause bloat ; killing H bovis when it is in the vertebral CANAL MAY CAUSE STAGGERING OR PARALYSIS. Cattle should treated either before or after these stages of grubs development. Cattle treated with IVERMECTIN Pour-On at the end of the fly season may be re-treated with ivermectin during the winter without danger of grub-related reactions. For further information and advice on a planned parasite control program, consult your veterinarian. INDICATIONS: IVERMECTIN Pour-On applied at the recommended dose level of 500 mcg/kg is indicated for the effective control of these parasites. GASTROINTESTINAL ROUNDWORMS, Ostertagia ostertagi (including inhibited stage) (adults and L4), Haemonchus placei (adults and L4), trichostrongylus axei Adults and L4, T. Colubriformis (adults and L4), cooperia spp. (adults and L4), Strongyloides papillosus (adults), Oesophagostomum radiatum (adults and L4), Trichuris spp. LUNGWORMS: Dictyocaulus vivparus (adults and L4), CATTLE GRUBS: Hypoderma bovis H. Lineatum (parasitic stages) MITES: SARCOPTES SCABIEI VAR. BOVIS LICE: Linognathus vituli, Haematopinus eurysternus, Damalinia bovis, solenopotes capillatus, HORN FLIES: Haematobia irritans, treatment of Cattle for horn Flies, IVERMECTIN pour-On controls horn flies (Haematobia Irritans) for up to 28 days after dosing. For best results IVERMECTIN Pour-On should be part of a parasite control program for both internal and external parasites based on the epidemiology of these parasites. Consult your veterinarian or an entomologist for the most effective timing of applications. PERSISTENT ACTIVITY: IVERMECTIN Pour-On has been proved to effectively control infections and to protect cattle from re-infection with Ostertagia ostertagi, Oesophagostomum radiatum, Haemonchus placei, Trichostrongylus axei, Cooperia punctata and Cooperia oncophora for 14 days after treatment. Before purchasing any items/product, please insure your country allows this product to be imported. Canceling an Order If you need to cancel an order or make changes, the request must be made within one hour of placing the order and confirmed by an E-Commerce Customer Service Representative. The following rules apply: · Products must be in original packaging and in a new and resalable condition. · Any product that was used or fully/partially installed is non-returnable. Excellent customer service and competitive pricing, is what you will receive when purchasing from Livestock Concepts. We supply a complete line of animal health supplies to livestock producers, veterinarians, pet and equine owners, as well as hobby farmers. We offer over 14,000 items for cattle, swine, sheep, goats horses, pets, birds and exotic animals. We market to 50 states as well as over 60 countries. We provide fast, friendly service, and cherish our customers. Books & Educational Items. Buckets, Tubs & Feeders. Clothing & Boots & Belts. Lawn Garden & BackYard. Pet Equipment & Treats. Rodent & Pest Control. The item “IVERMECTIN Pour On Cattle Wormer 20 Liter Internal External Parasite Control” is in sale since Sunday, August 26, 2018. This item is in the category “Business & Industrial\Agriculture & Forestry\Livestock Supplies\Beef Cattle”. The seller is “livestockconcepts” and is located in Hawarden, Iowa. This item can be shipped to United States. 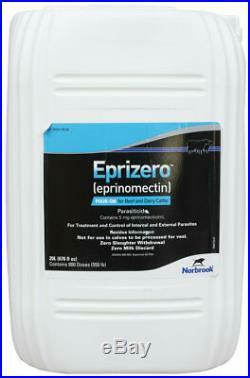 Eprizero Eprinomectin Pour On 20 Liter Cattle Wormer Parasites Zero Withdrawl. Eprizero Pour-On contains eprinomectin for broad spectrum treatment and control against 39 species of internal and external parasites, including roundworms, lungworms, grubs, sucking and biting lice, mange mites and horn flies. Eprizero is for use in beef and dairy cattle, including lactating dairy cattle, at 8 weeks of age and older. Dosage is 1 ml for each 22 lbs. Apply to the backline from the withers to tailhead. Weather conditions, including rainfall, do not affect efficacy of Eprizero. No meat withdrawal or milk withholding period. Before purchasing any items/product, please insure your country allows this product to be imported. Canceling an Order If you need to cancel an order or make changes, the request must be made within one hour of placing the order and confirmed by an E-Commerce Customer Service Representative. The following rules apply: · Products must be in original packaging and in a new and resalable condition. · Any product that was used or fully/partially installed is non-returnable. Excellent customer service and competitive pricing, is what you will receive when purchasing from Livestock Concepts. We supply a complete line of animal health supplies to livestock producers, veterinarians, pet and equine owners, as well as hobby farmers. We offer over 14,000 items for cattle, swine, sheep, goats horses, pets, birds and exotic animals. We market to 50 states as well as over 60 countries. We provide fast, friendly service, and cherish our customers. Books & Educational Items. Buckets, Tubs & Feeders. Clothing & Boots & Belts. Lawn Garden & BackYard. Pet Equipment & Treats. Rodent & Pest Control. The item “Eprizero Eprinomectin Pour On 20 Liter Cattle Wormer Parasites Zero Withdrawl” is in sale since Wednesday, February 20, 2019. This item is in the category “Business & Industrial\Agriculture & Forestry\Livestock Supplies\Beef Cattle”. The seller is “livestockconcepts” and is located in Hawarden, Iowa. This item can be shipped to United States. 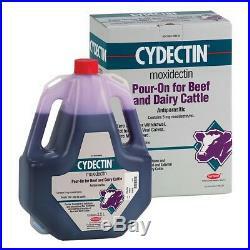 Ivermectin Pour On for Cattle contains 5 mg ivermectin/ml. It delivers internal and external parasite control in one convenient low-volume application. For the treatment and control of gastrointestinal roundworms (including inhibited Ostertagia ostertagi) lungworms, grubs, horn flies, sucking and biting lice, and sarcoptic mange mites in cattle. The dose is 1 ml for each 22 lb of body weight. Do not use in female dairy cattle of breeding age. Cattle must not be treated within 48 days of slaughter for human consumption. DIRECTIONS: The dose rate is 1 ml for each 22 lb of body weight. The formulation should be applied along the topline in a narrow strip extending from the withers to the tail. Administration- Squeeze-measure pour system (250ml or 1 liter bottle with 25 ml measuring Cap) Attach metering cap to bottle. Select the correct dose rate by rotating the adjuster cap in either direction to position the dose indicator to the appropriate dose. Gently squeeze the bottle to fill to level (any excess will return to bottle) and then tip and apply to animal along topline. Backpack 84.5 fl oz/2.5L pack and 169 fl. Connect the applicator gun to the backpack as follows: Attach the open end of the draw-off tubing to the DOSING EQUIPMENT. Because of the solvents used in the formulation, only the Protector Drench Gun from instrument Supplies Limited, or equivalent, is recommended. Gently prime the applicator gun, checking for leaks. S directions for adjusting the dose. When the interval between uses of the applicator gun is expected to exceed 12 hours, disconnect the gun and draw-off tubing from the product container and empty the product from the gun and tubing back into the product container. To prevent removal of special lubricants from the Protector Drench Gun, the tubing must not be washed. WHEN TO TREAT CATTLE FOR GRUBS: IVERMECTIN Pour-On effectively controls all stages of cattle grubs. However, proper timing of treatment is important. For the most effective results cattle should be treated as soon as possible after the end of the heel fly (warble fly) season. While this is not peculiar to ivermectin, destruction OF Hypoderma larvae (cattle grubs) at the period when these grubs are in vital areas may cause undesirable host-parasite reactions. Killing Hypoderma lineatum when it is in the esophageal tissues may cause bloat ; killing H bovis when it is in the vertebral CANAL MAY CAUSE STAGGERING OR PARALYSIS. Cattle should treated either before or after these stages of grubs development. Cattle treated with IVERMECTIN Pour-On at the end of the fly season may be re-treated with ivermectin during the winter without danger of grub-related reactions. For further information and advice on a planned parasite control program, consult your veterinarian. INDICATIONS: IVERMECTIN Pour-On applied at the recommended dose level of 500 mcg/kg is indicated for the effective control of these parasites. GASTROINTESTINAL ROUNDWORMS, Ostertagia ostertagi (including inhibited stage) (adults and L4), Haemonchus placei (adults and L4), trichostrongylus axei Adults and L4, T. Colubriformis (adults and L4), cooperia spp. (adults and L4), Strongyloides papillosus (adults), Oesophagostomum radiatum (adults and L4), Trichuris spp. LUNGWORMS: Dictyocaulus vivparus (adults and L4), CATTLE GRUBS: Hypoderma bovis H. Lineatum (parasitic stages) MITES: SARCOPTES SCABIEI VAR. BOVIS LICE: Linognathus vituli, Haematopinus eurysternus, Damalinia bovis, solenopotes capillatus, HORN FLIES: Haematobia irritans, treatment of Cattle for horn Flies, IVERMECTIN pour-On controls horn flies (Haematobia Irritans) for up to 28 days after dosing. For best results IVERMECTIN Pour-On should be part of a parasite control program for both internal and external parasites based on the epidemiology of these parasites. Consult your veterinarian or an entomologist for the most effective timing of applications. PERSISTENT ACTIVITY: IVERMECTIN Pour-On has been proved to effectively control infections and to protect cattle from re-infection with Ostertagia ostertagi, Oesophagostomum radiatum, Haemonchus placei, Trichostrongylus axei, Cooperia punctata and Cooperia oncophora for 14 days after treatment. 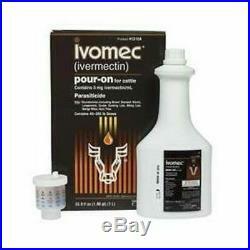 The item “IVERMECTIN Pour On Cattle Wormer 20 Liter Internal External Parasite Control” is in sale since Saturday, February 2, 2019. This item is in the category “Business & Industrial\Agriculture & Forestry\Livestock Supplies\Beef Cattle”. The seller is “petsandvet” and is located in Hawarden, Iowa. This item can be shipped to United States. 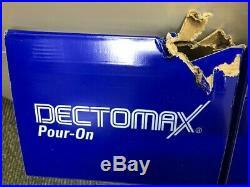 This listing is for one box containing (2) 5L bottles of Dectomax Pour On Solution for Cattle. 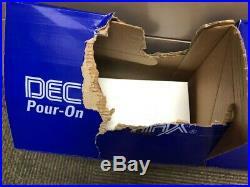 There are TWO boxes available and one 5L bottle out of each set has some minor tearing/damage to the outer box. All inner contents are intact and 100%! DECTOMAX® (doramectin) Pour-On Solution controls 33 parasites and larval stages for broad coverage against internal and external parasites. 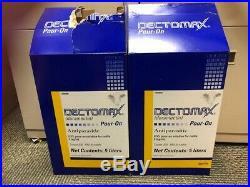 DECTOMAX Pour-On has the longest duration of any non-prescription product on the market with protection for up to 77 days against the biting cattle louse (Bovicola bovis). 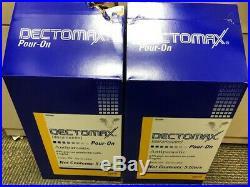 DECTOMAX Pour-On Solution is a ready-to-use, weatherproof, transparent, light-blue solution containing 0.5% w/v doramectin (5 mg/mL). Compared with ivermectin pour-on, cattle treated with DECOTMAX Pour-On demonstrated greater live weight at slaughter, 773 pounds compared to 752 pounds. Treating and controlling a wide range of roundworm and arthropod parasites which impair the health and productivity of cattle. For use on any age and class of beef cattle, including pregnant beef cows. Not for use in female dairy cattle 20 months or older. The control of the following harmful species of gastrointestinal roundworms, lungworms, eyeworms, grubs (see precautions), sucking lice and mange mites. Consult your veterinarian for assistance in the diagnosis, treatment, and control of parasitism. 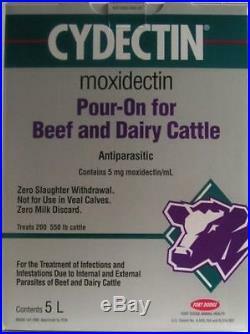 DECTOMAX Pour-On Solution has been proved to effectively control infections and to protect cattle from reinfection with Haemonchus placei for 35 days; Ostertagia ostertagi, Cooperia punctata, and Oesophagostomum radiatum for 28 days; and Cooperia oncophora and Dictyocaulus viviparus for 21 days after treatment. Weatherproof formulation for parasite control that wont wash off. DECTOMAX Pour-On is a novel fermentation-derived macrocyclic lactone discovered by Zoetis and derived from selected strains of Streptomyces avermitilis. It is formulated to deliver the recommended dosage of 500 µg/kg (227 µg/lb) body weight when applied topically at the rate of 1 mL/22 lb body weight. One topical treatment of DECTOMAX Pour-On significantly delayed biting and sucking lice infestation (P < 0.05) in treated calves grouped with lice-infested seeder calves. 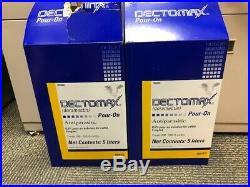 DECTOMAX Pour-On controls 33 stages of internal and external parasites with a single, convenient application. 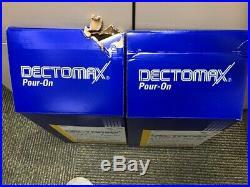 DECTOMAX Pour-On is safe for use on any age or class of beef cattle, including pregnant cows, calves and female dairy cattle up to 20 months of age. Administer DECTOMAX Pour-On solution at the recommended dosage of 1 mL (5 mg doramectin) per 22 lb body weight (or 10 mL/220 lb body weight). It should be applied topically along the midline of the back in a narrow strip between the shoulders and tailhead. 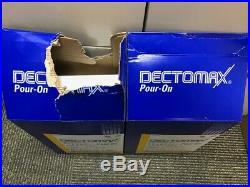 The item "DECTOMAX Pour On Cattle Wormer Parasites 5 Liter 2 Pack FREE SHIP GREAT PRICE" is in sale since Tuesday, February 19, 2019. This item is in the category "Business & Industrial\Agriculture & Forestry\Livestock Supplies\Beef Cattle". The seller is "fraub_67" and is located in Castle Rock, Colorado. This item can be shipped to United States.